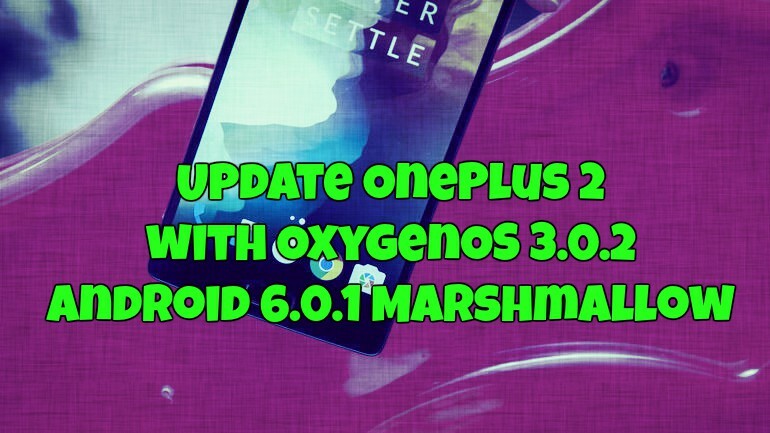 OxygenOS 3.0.2 Android 6.0.1 Marshmallow Official update in now released for the OnePlus 2 Mobile users. The OTA update is already rolled out and most of the Oneplus 2 users already upgraded their mobile with OxygenOS 3.0.2. This update is packed with new features and enhancements, which we discussed it later. If you are the Oneplus 2 user, then go to About Phone and Check the system updates to get this official Android 6.0.1 Marshmallow update. If you are the rooted phone user with TWRP recovery then you will not get this update on your phone, you have to flash it manually on your phone. Here in this guide, we will show you how to install the OxygenOS 3.0.2 Android 6.0.1 Marshmallow update on Oneplus 2. The guide is pretty simple and all it take a few minutes to complete the whole task. This guide e will work for bot rooted and non-rooted Oneplus 2 users. Before following this guide do take the Full backup of your phone. If you are the rooted user then also make the nanndroid backup of your previous ROM, in case something goes wrong during the flashing process, you can quickly restore the previous ROM on your Oneplus. Let us take a look how to do that ion straightforward and easy methods. To get started all you need the Full ROM zip file of OxygenOS 3.0.2 update and have flash manually on your phone with the help of recovery. We tested this method on our Rooted with TWRP recovery phone. a) Oneplus 2 Phone rooted or non-rooted. b) Battery Above 60%. Make sure that the phone has the sufficient battery to flash the ROM file. NOTE: For Rooted User below than Ver 3.0. This method will not work on Official TWRP Recovery. You need a Modified Grarak TWRP recovery. Step 2. Now move the Zip file on your phone and remember the location. Step 3. Boot your Oneplus 2 in recovery mode. To do this Switch off your OnePlus 2 and then just hold Volume down button, and then press the power button once. Step 4. Once your phone in recovery Mode. Go to Wipe and Wipe Cache, Dalvik Cache and Data. Step 5. Select the Install Option on your Phone and Browse for the Zip file and Select it. Step 6. Now flash the zip file on your phone. Rooted User selects Swipe to flash. Step 7. Now the OxygenOS 3.0.2 flashing process will start on your phone and it will take some time. Step 8. Once complete Reboot System, First boot will take some. In our Oneplus 2 Rooted phone, it takes 5 minutes to boot. Now you Oneplus 2 is running on the latest OxygenOS 3.0.2 Android 6.0.1 Marshmallow update. My phone icon shows up like my other drives, but it only opens to show an empty window with zero files or folders. O would have waited if I’d known about this bug. Although it is a bit late for the reply, I had the same problem today. I found that after the update, there are multiple options on how a USB connects to the device. Just bring down the top bar, you will find “USB for charging” written there. Just click it and select “File transfers” and it will start showing the files on your PC.